Dummy or Driver? Lionel #6-18923 new haven bought as dummy, but.....? Might be a hobby, wife thinks addiction...... and online buys are "Gambling", right? SO, I dont know my trains, just wanted my first F3 and dummy, Dummy or Driver? Lionel #6-18923 new haven bought as dummy, but.....? 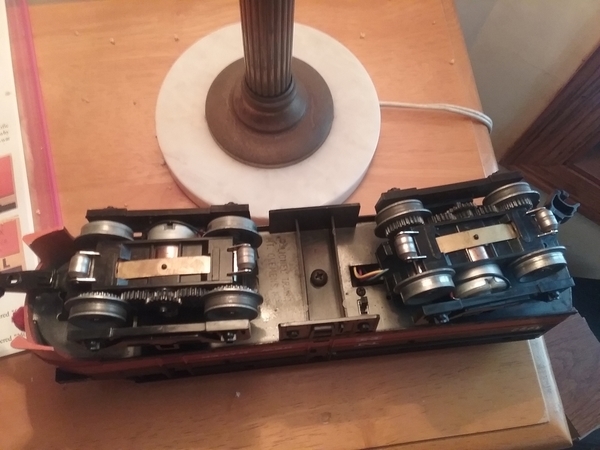 and then, bought a Lionel #6-18922 as driver and it has two- 2 - motors? Thoughts my fellow "Train Gurus"..
.......and why are the cars different height? F3 tallest... Boxcar shorter, Babyruth (might be clearly .027?) and then MTH... is that manufactuer of "SUPER O"..
18922 is normally the powered unit, 18923 should be a dummy unit. The trucks on the dummy units have geared wheels and if I recall correctly, could be converted into a powered truck by adding the can motor, pickups and gears. However the dummy unit would not have traction tires if converted. Miggy, first off these are 027 Alco FA's and not F-3's. Even the postwar/MPC era F-3's were very close to scale size, albeit lacking in details compared to current scale engines. The Lionel Alco FA here is smaller than scale, hence the difference in height, as well as length. To further confuse things, there are two different types of 027 Alco FA's: One with a die-cast frame, where the engine shell is lower, and then the sheet metal framed Alco FA, where the overall height is a little taller. To add a little more confusion to this, some of the very late 027 Alco FA's came with a plastic frame to replace the sheet metal one, so the shell sits lower and matches more closely the height of the 027 streamline passenger cars. The Reading comes to mind as well as a Amtrak one that had plastic frames. The pilot is another point of variety. Most were either open or closed, but even the MPC engines had the molded bar across the open ones, below the coupler. At some point during the Kughn era of Lionel, the bar below the coupler on the open pilot was removed entirely, like with your New Haven ones here. Ed is right... the dummy unit you bought has been altered. The powered unit here was cataloged with dual motors, as were all the other 027 Alco FA's. During the LTI years (Kughn era) all the powered Alco FA's came with dual can motors. The New Haven dummy unit here came with a horn. One truck of that dummy, would have roller pickups, the other none. Both trucks on the dummy came with geared wheels, but no grooves in the wheels for traction tires. So there's another sign that the one you bought has been altered. Also one of your couplers is broken so you need a new plunger armature. In the photo I can see the rear part of the plunger armature sticking off to the side. They should be able to pull the odd gi-raffe or three, yes. It's crackers to give a rozzer the dropsy in snide! Looking for O scale 1/43 Nash Metropolitan.